The Cheddar Gorge 5km and 10km start at the top of Cheddar Gorge (even we thought it would be tough to ask you to start at the bottom!). 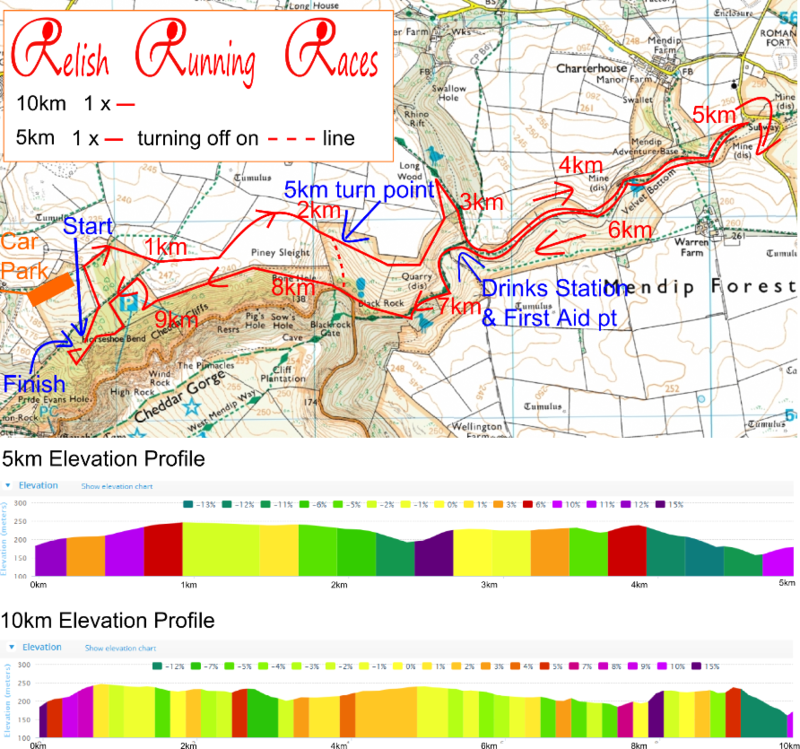 There is a gradual rise to the 1km marker where runners enter Piney Sleight were the terrain levels off. Just after 2km there is a short, steep and stoney descent. Runners taking part in the 5km will make a right turn down to the bottom of the gorge (the dotted line), where as the 10km runners will power up the other side of the short hill and carry on along the top of the Gorge. To runners right, is a great view of Velvet Bottom through the trees, where they will run later. After a decent down to the 3km point, runners will make a left to run out and back section along Velvet Bottom. This area is steeped in history; the whole area has been extensively mined from the Roman times through to Victorian. This area is generally flat, though runners will have to clamber over 10ft high walls which form the old mineral settling pools from the lead mines. Keep an eye out for runners heading the other way! Runners now pass the drinks station for the second time before passing through the imposing cliff face at Black Rock. A right turn at 7km, turns runners on to the most challenging part of the course on to some rocky terrain. We are now at the bottom of the dotted line on the map, and 10km runners rejoin the course taken by the 5km runners. Both sets of racers will have a few steps to climb, followed by wonderful views from the very edge of the Gorge all the way to the 9km point. The final descent awaits, a very steep run down to the registration area at Strawberry Fields, which will retrace the route taken by athletes to the top of the Gorge. A sprint finish along the top of the one of the old strawberry growing walls will see runners to the finish in an amphitheatre style atmosphere! 1 Mile The first 1km carries on uphill (we couldn’t let you get away with only walking to the top!) but there are some fantastic views if you look over to the right hand side. The 1km point comes at the entrance to the Piney Sleight field. This is a flat section through open fields. Follow the lines and paths cut into the grass. 1 Mile – 2 Miles There is a sudden rocky section on a slight downhill just after the 2km point. ** Runners of the 10km, half marathon and marathon will carry straight on up the other side of the valley. The athletes racing the 5km make a right hand turn downhill. Look out for the signs. ** Another flat section and downhill are to come with a couple of stiles to negotiate. There is a downhill run down to the 3km mark which could be slippery if wet. 2 Miles – 3 Miles Make a left hand turn past the first drinks station into Velvet Bottom. After 50m the half marathon and marathon race will turn left (marathon runners follow half marathon signs) and the 10km race goes straight on. There are 4 fields to cross, all heading due North. After the fields is a small muddy and wooded section which will be slippery. 3 Miles – 4 Miles ** Road Crossing ** Immediately after the 3 miles sign is a road crossing which is open to traffic. Please do not wear personal music players as you need to be able to hear the traffic. There is a marshalled crossing but the final decision to cross the road is yours alone. After emerging onto the road, make a right hand turn and cross over the road after 20m. The course now runs through a technical valley with a small river crossing and then run up the other side. Climbing out the other side through open fields, keep a look out for the next landmark, a WWII Bunker on the horizon. After the bunker is a marked change of terrain, it will now become very boggy for 200m – even the most stable looking ground may deceive you! Pick your best line across the bog (there is a small path tight against the perimeter path may be your best bet, but feel free to pick your own path) Make sure your shoes are done up tight! 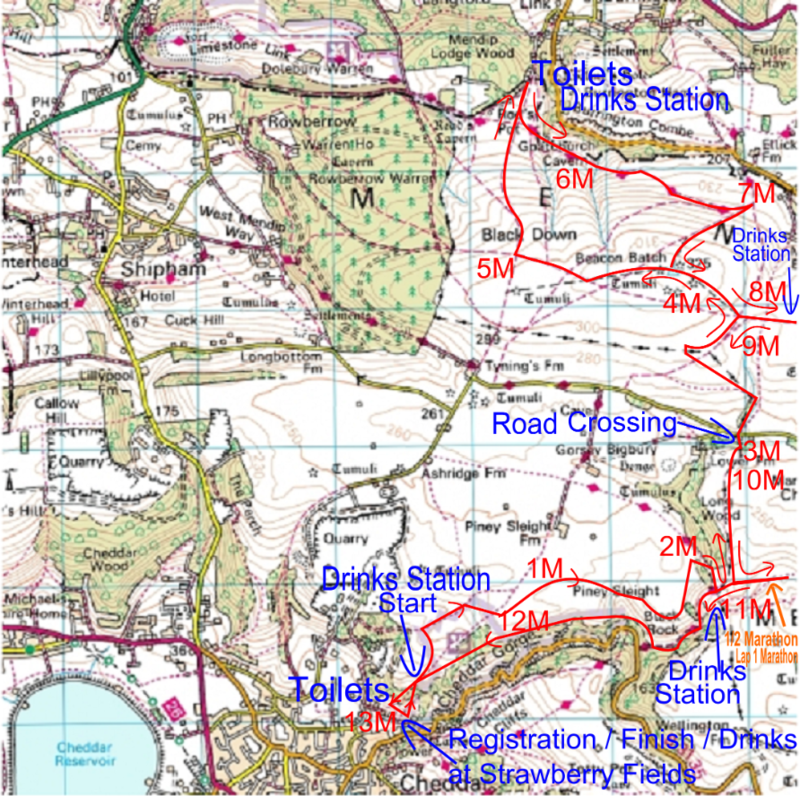 4 Miles – 5 Miles After negotiating the bog, make a left hand turn and head up to Beacon Batch, the highest point on the Mendip Hills. Enjoy the views. Over to your left you will see the starting point at Cheddar Gorge as well as the Bristol Channel, Wales and everything around with this fantastic 360 degree vantage point. Keep left of the trig point and follow some flat paths along the top of the hill. 5 Miles – 6 Miles Make a right hand turn down what is known at the Motorway, but is nowadays very much free of traffic. This 20m wide ‘road’ was the Roman path over the Mendip Hills, and as such, makes few deviations and will be a 1 km straight down descent down to the far side of the hills. There is now a 200m out and back section to reach the next Feed Station and there are also 2 Portaloos at this feed station. Retrace your steps back to the cross roads and make a left. 6 Miles – 7 Miles Probably the flattest mile of the race, enjoy some quite woodland paths including two brook crossings. 7 Miles to 8 Miles Time to climb once again as runners head back to Beacon Batch, with some more great views to the right hand side over towards the Bristol Channel. Make a left at Beacon Batch and head towards the radio masts in the distance. 8 Miles to 9 Miles This is an out and back section along a path which is narrow in places. More treats at the feed station await by the radio masts. 9 Miles to 10 Miles ** Road Crossing ** It is now time to negotiate the bog once again, I hope you marked your path well on your earlier crossing...Back across Blue Bell Valley and safely across the road. 10 Miles to 11 Miles Retrace your steps back towards Velvet Bottom. Half Marathon Runners and Marathon Runners on Lap 1 make a left turn here and complete a short out and back section along Velvet Bottom. You will now pass an earlier Feed Station and make a left hand turn along Black Rock. 11 Miles to 12 Miles Save some energy for this challenging section. Peel off right up a rocky climb before climbing up one or two steps....This is a flat section along the cliff side of the gorge with great views to the far side. 12 Miles to 13 Miles There are some narrow sections ahead but there are a few opportunities to overtake. The 9km point takes you past the race start area and represents the last place to overtake for a while. There is another feed station at the top of the gorge before the descent. Enjoy the long 850m downhill to the bottom of Cheddar Gorge. This is a narrow path but there are a couple of opportunities to pass where the path splits, both routes are of equal length. The final 150m is through Strawberry Fields to the registration point. There are 2 Portaloos here again just off the course, these are intended to be used by Marathon runners who are still mid race. There are toilets in town, about 300m from the registration point, for runners who have finished and for spectators.